What is a Pennsylvania Sublease Agreement? Pennsylvania Sublease Agreement: What Is It? In Pennsylvania, a sublease agreement is a type of lease agreement between two tenants, instead of between a tenant and the landlord, In this type of agreement, the tenant who originally signed a lease (the sublessor) finds another tenant to take his or her place in the rental (known as a sublessee). This means that the sublessee will take possession of the rental, pay rent, and abide by the rules of the lease just like the original sublessor did. These types of agreements are usually for a short period of time, anywhere from one month to a year, but can last longer if the tenants agree. One important fact about sublease agreements is that the original tenant’s name will remain on the lease throughout the sublease. This means that if the sublessee fails to pay rent on time or damages the property, the sublessor will be held responsible. 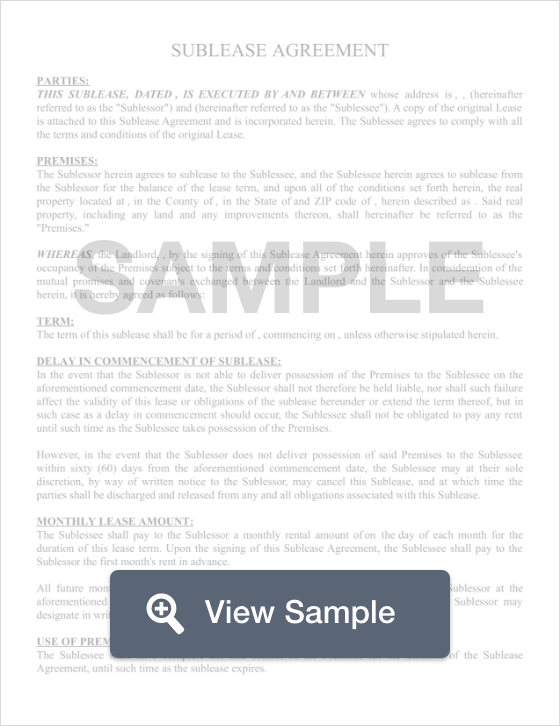 According to Pennsylvania Law, a tenant must abide by the terms of his or her lease. If a lease does not prohibit subleasing, then the tenant must receive written permission in order to be protected when subleasing the rental.